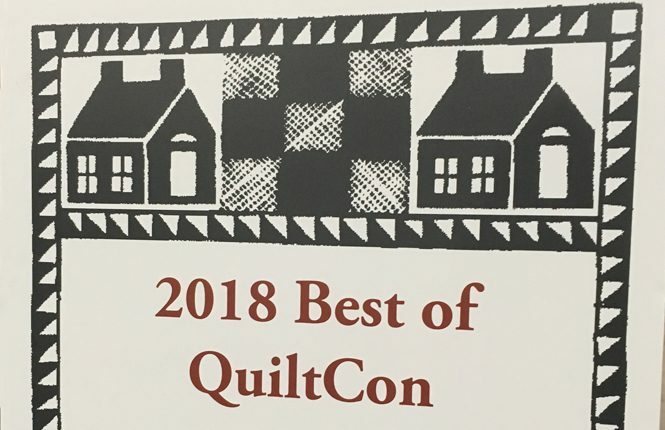 I was super excited to see the Best of QuiltCon 2018 show at the Vermont Quilt Festival. 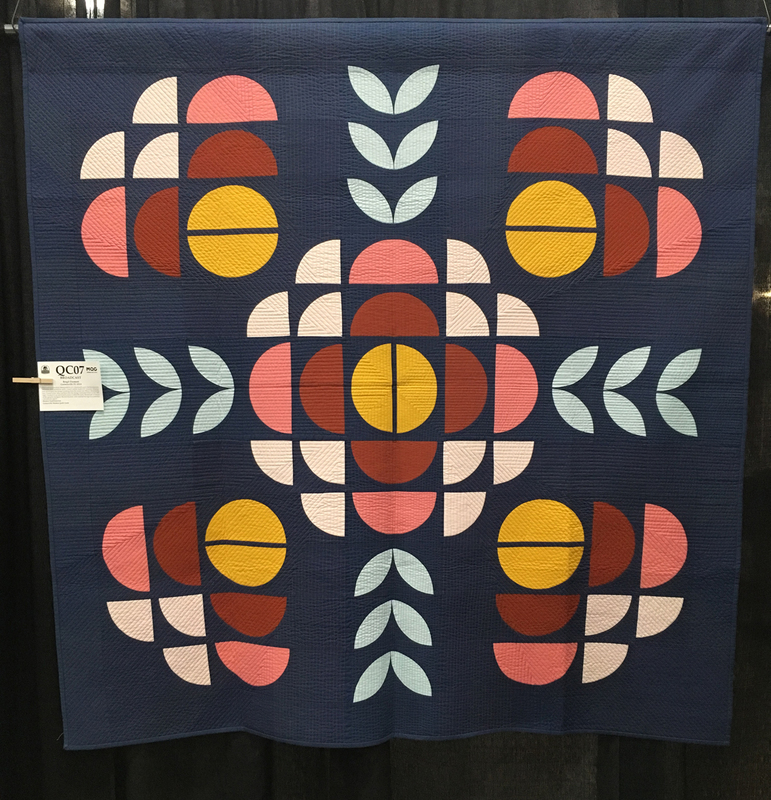 In between teaching workshops, I was able to document the show and share it with you! Earlier this year, I attended QuiltCon in Pasadena, California. 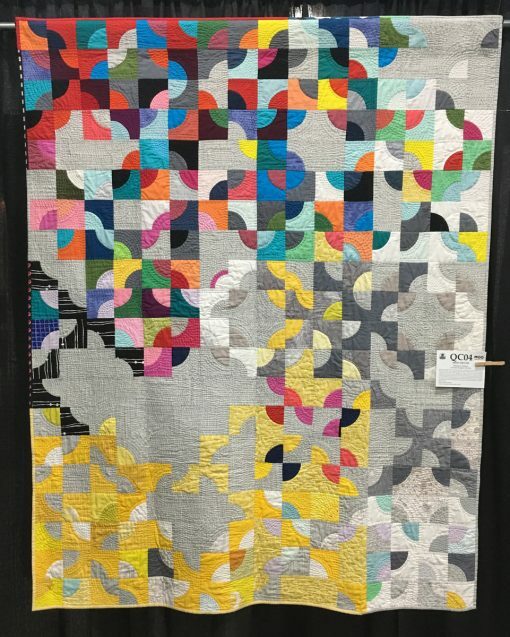 While I love the show, looking at 450+ quilts in 4 days can be overwhelming! 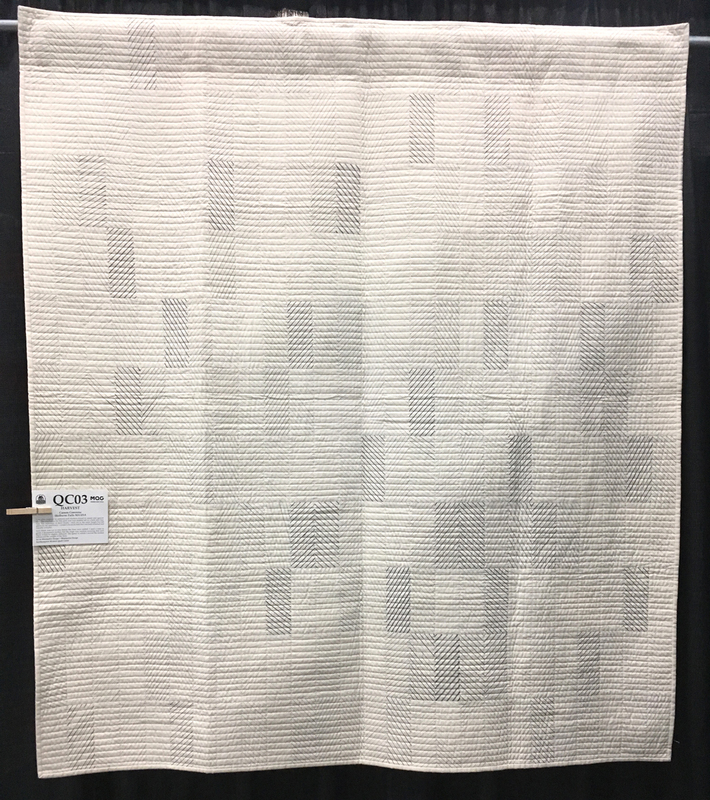 I walked through the entire show and still felt like there were quilts in the Best of Show that I never saw. Sometimes less is more. 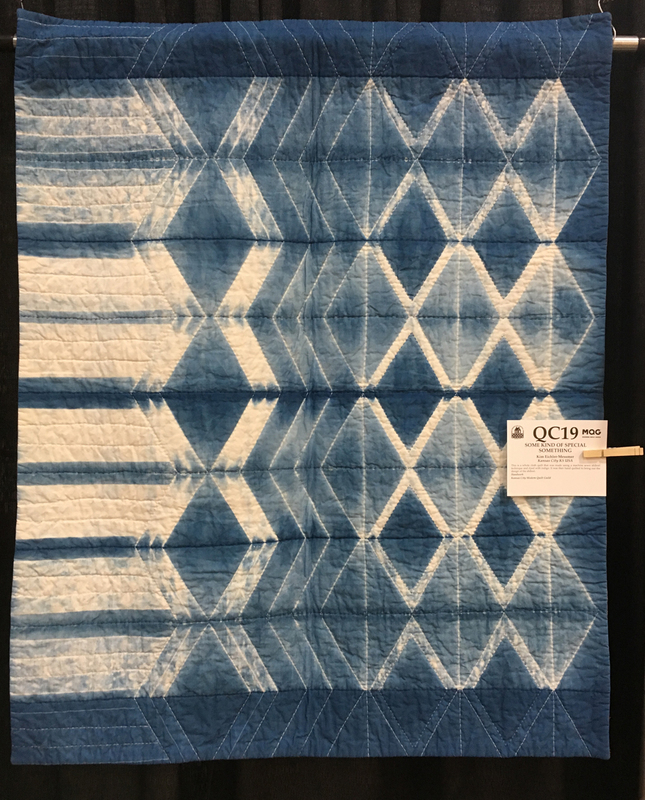 Included in this virtual modern quilt show is a walkthrough video as well as full and detail photos of all of the quilts. All descriptions were written by the makers. Category: Use of Negative Space. 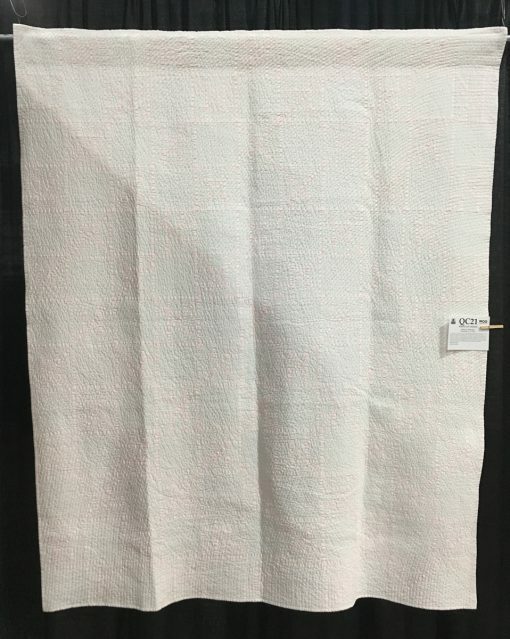 “White on White” by Robert J. Bosscher Statement: As quilters, we spend a lot of time hiding or diminishing aspects of our process. 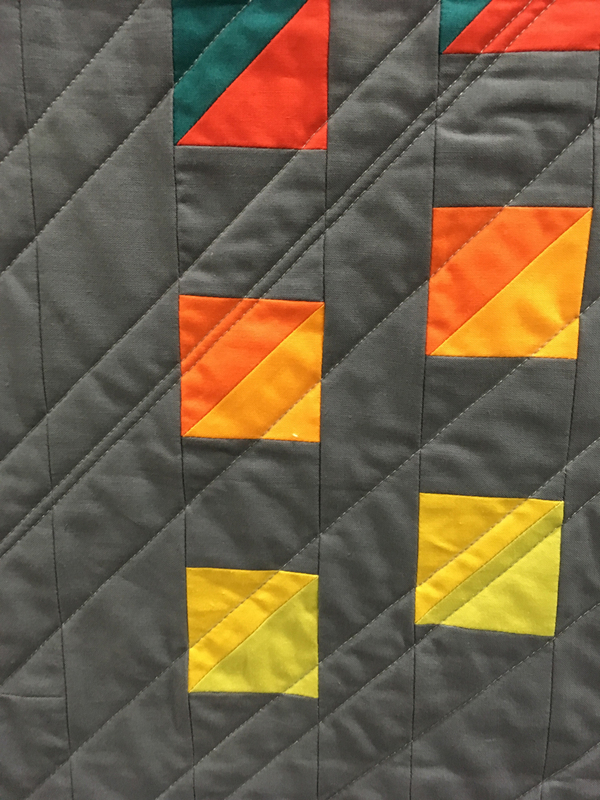 Medium grey seems to be the standard for piecing thread, and seams are usually only delineated by a change in fabric color pattern. In this quilt, I wanted to explore pattern that has no change in texture or color. 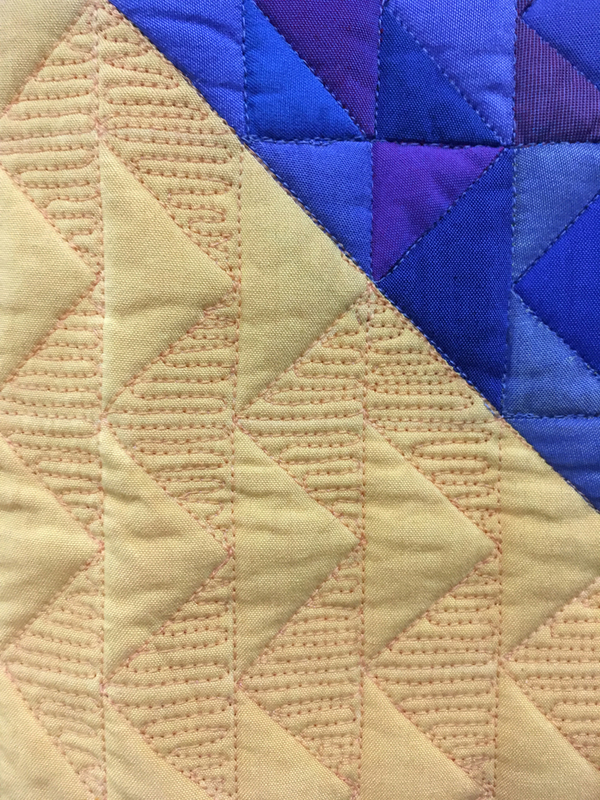 I used a variation of the traditional Irish Chain pattern and I used neon thread for the piecing to highlight the seamwork. This process has created a juxtaposition between a complext design and a subtle color effect. Statement: The quilting design for “Pivoted Plaid” was the first part of the design process, and it determined how the quilt top would be pieced. The matchstick quilting in a variety of thread weights creates the design with a small amount of piecing, playing a strong supporting role. 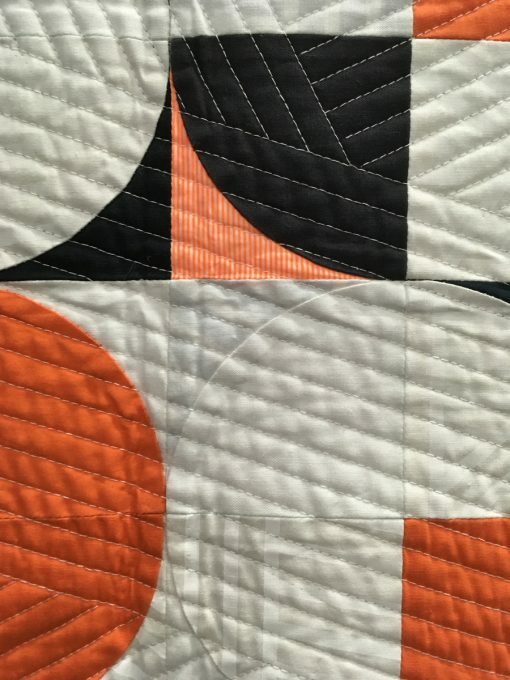 The simple piecing allows the stitching to activate the negative space and bring to life a nearly blank canvas. 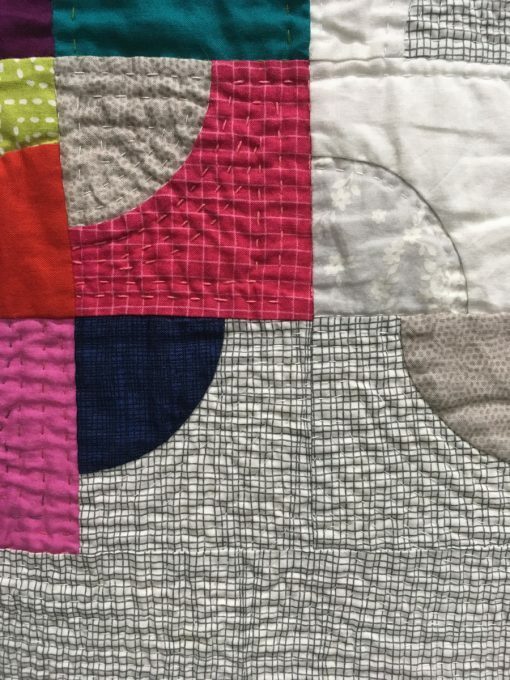 Statement: Each block consists of a pieced, inset oval, sliced, with strips shifted and sewn back together to form the appearance of a sliced circle. 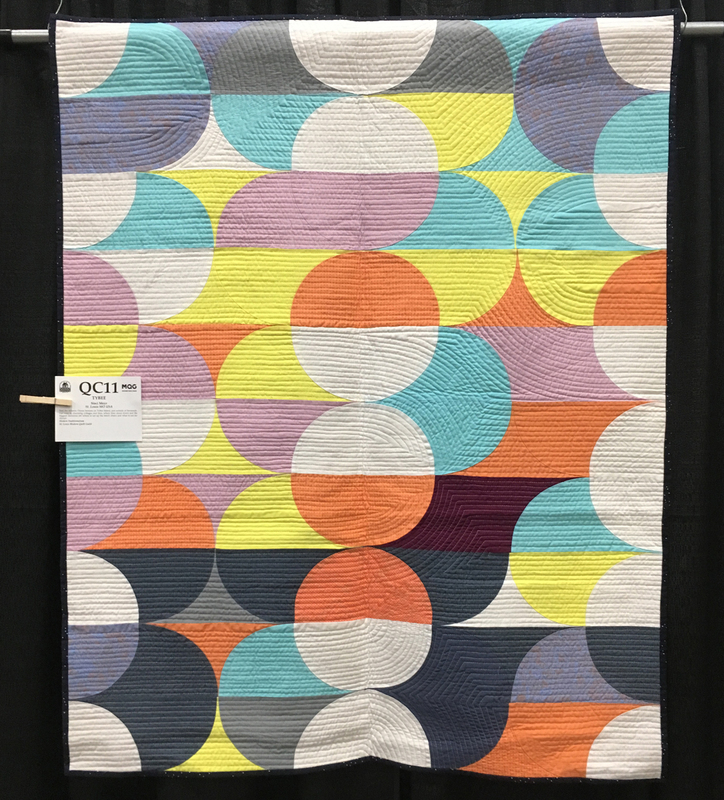 I chose a neutral, yet interesting background fabric and a subtle print in a bold color to emphasize the deonstructed circle shape. Statement: I wanted to explore a new palette and a new form with the quilt. I played with the value placement to create areas where the design flowed and then came to an abrupt stop. 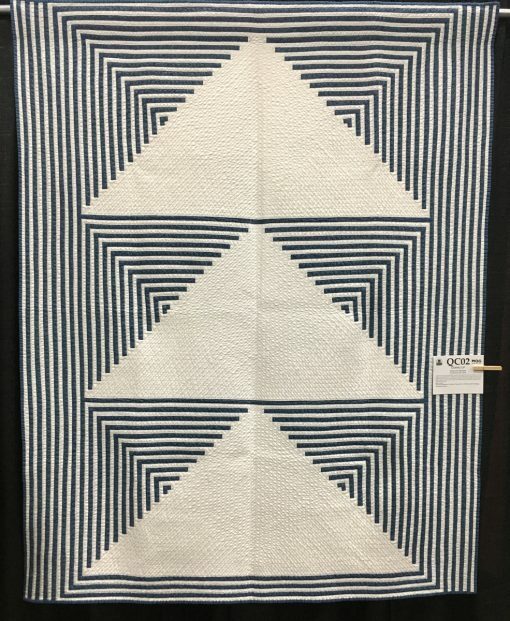 Quilted by hand in large waves a la Sherri Lynn Wood style. 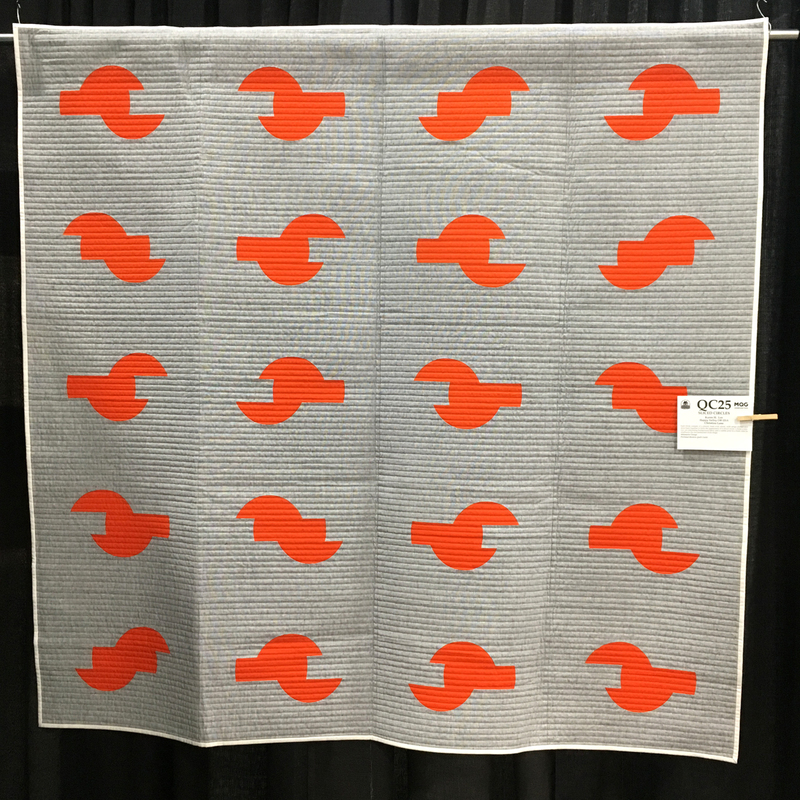 Statement: Rise Up is designed using a continuum of three modern variations of the flying geese block, playing with asymmetry, negative space, and proportion to create movement. 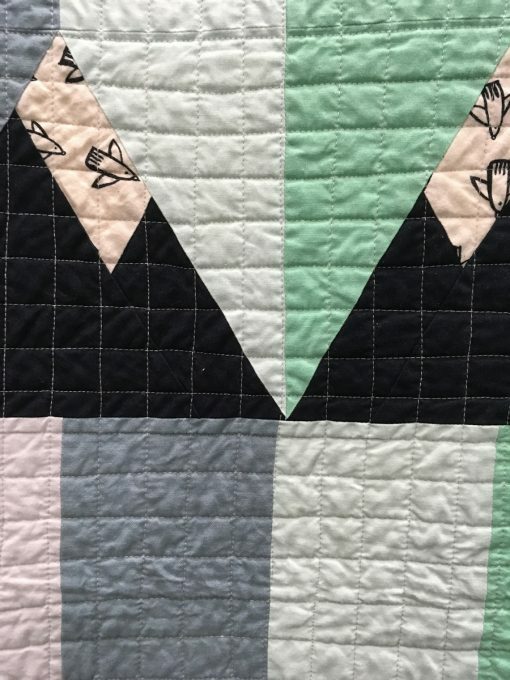 A high contrast palette also help modernizes this traditional block, and combining repetition and alternative gridwork emphasizes the flow of the moving geese. 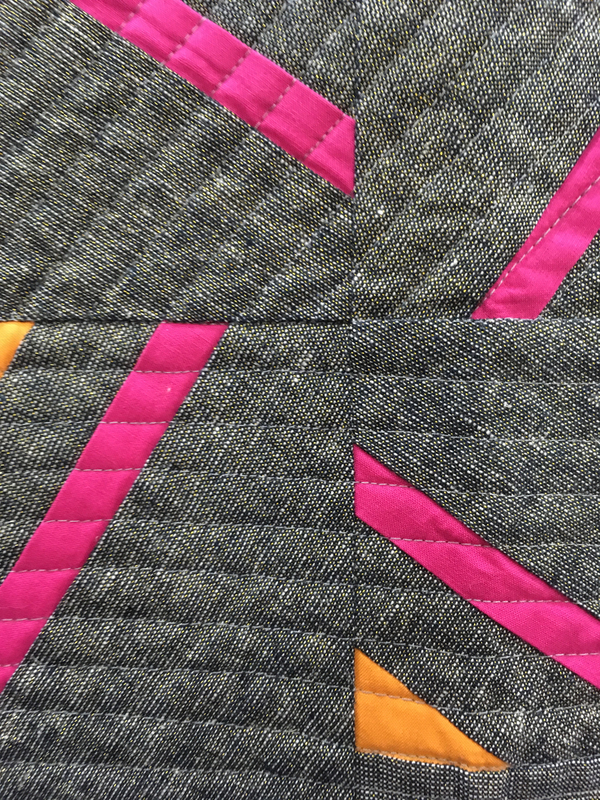 The straight-line quilting was done entirely on my Singer Featherweight 221. Rise Up is about finding hope. “Some Kind of Special Something” by Kim Eichler-Messmer. Statement: This is a whole cloth quilt that was made using a machine sewn shibori technique and dyed with indigo. 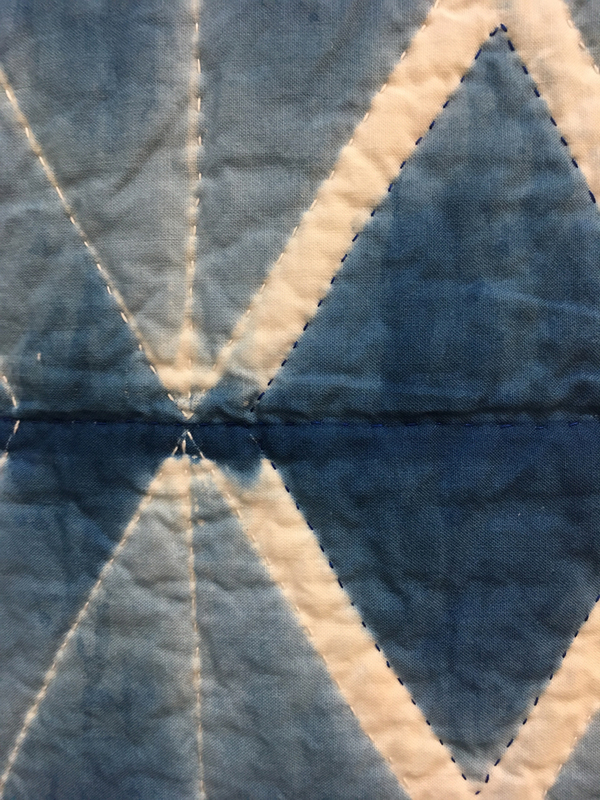 It was then hand quilted to bring out the design of the shibori. 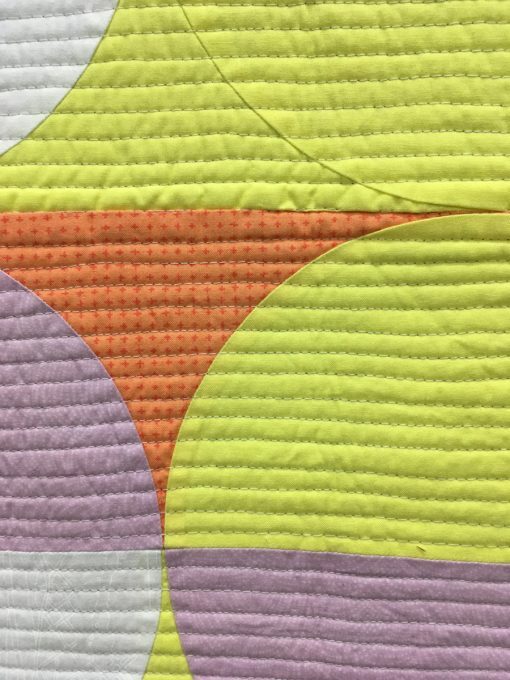 detail of “Some Kind of Special Something” by Kim Eichler-Messmer. “Bridges” by Anne Sullivan. 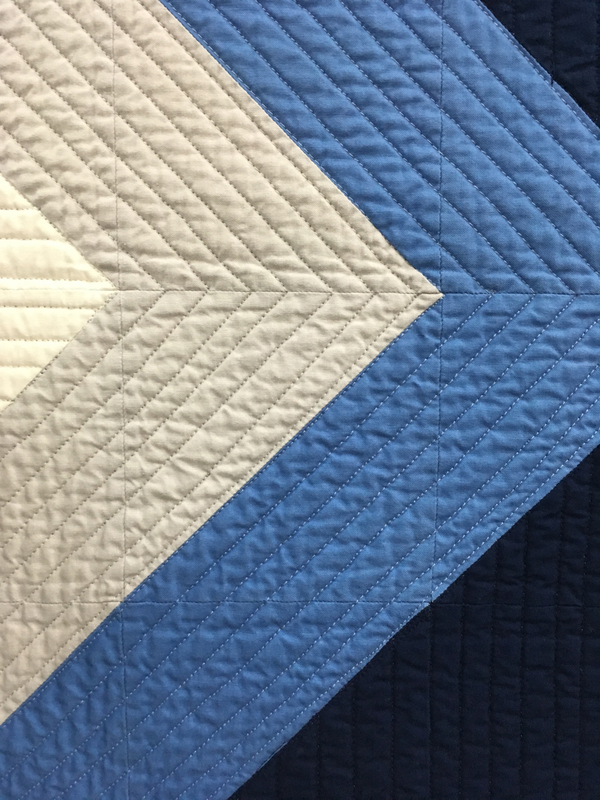 Statement: When designing quilts, I often give myself challenges to work with shapes I’m not comfortable with. 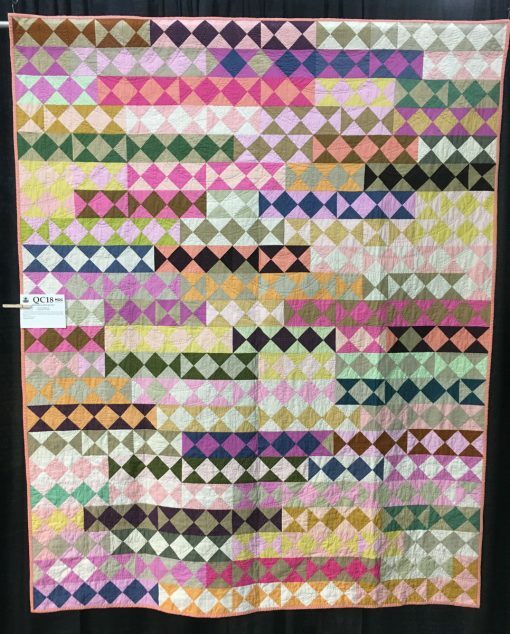 I had done some designs working with curves but I challenged myself to make a block that mixed curved piecing with rectangles or squares. While playing, I came up with this design. I was immediately drawn to the way the shapes reminded me of some of the bridges I’ve seen while exploring Oregon while visiting family. I chose these colors because they remind me of the way bridges are often decorated for the holidays. detail of “Bridges” by Anne Sullivan. “Neon Lights” by Jen Sorenson. Statement: I love using different fabric types in combination for dramatic effect. 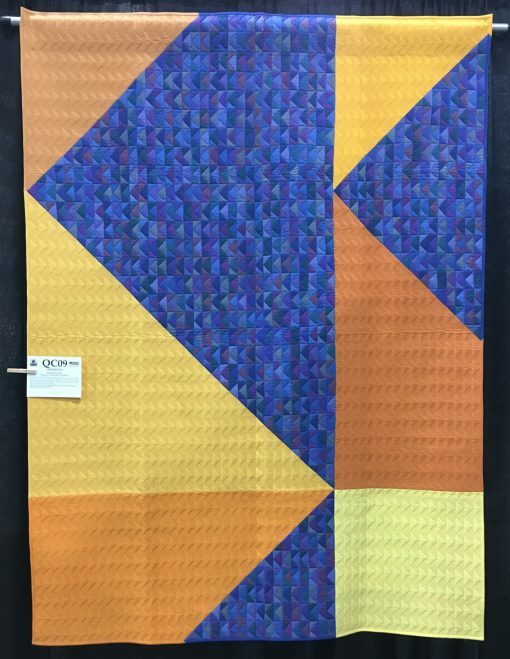 The gold in this linen fabric inspired the yellows, pinks and oranges used in this paper pieced quilt. I designed it while planning with various triangle shapes and negative space. After experimenting with various layouts, I settled on the one seen here after being inspired by the night sky and the bright stars one night. detail of “Neon Lights” by Jen Sorenson. “Mod Garden” by Jack Weise. Statement: I attempted to transform a traditional double tulip block into a more modern graphic by using only two colors in the block. 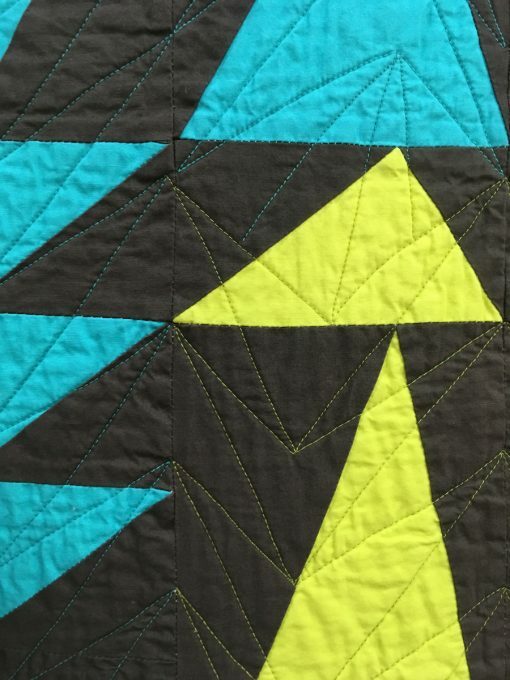 As an architect, I am trained to design in plan and elevation views and this has carried through into my quilt design. Through the traditional lines in the pieced blocks, the tulip is seen in elevation view. The quilting hints at a tulip in plan view with the stitches defining the extent of the petals and the colored square representing the bulb. The two views of the flower provide a new twist on the “double tulip”. detail of “Mod Garden” by Jack Weise. “Cielo” by Kristi A. Schroeder. 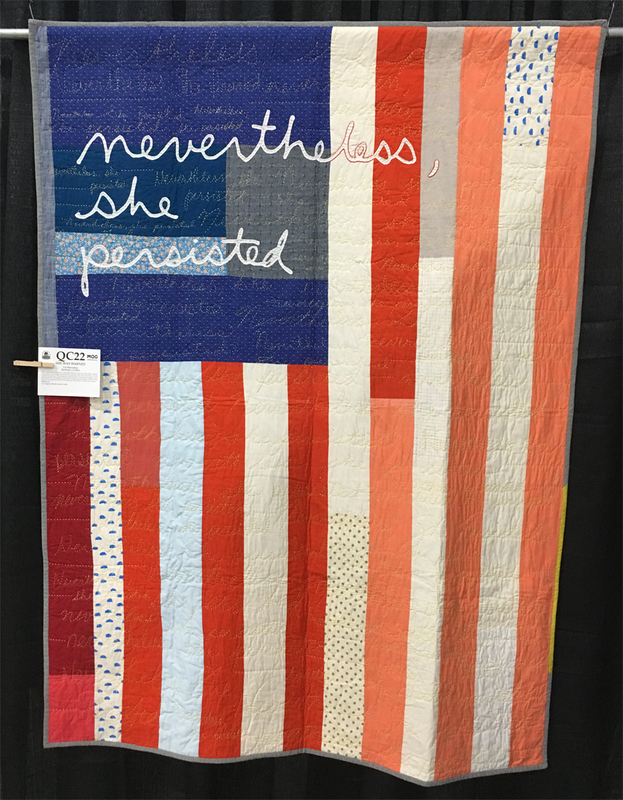 Statement: This quilt is featured in the book Southwest Modern and is Ms. Schroeder’s first publication with Lucky Spool Media. 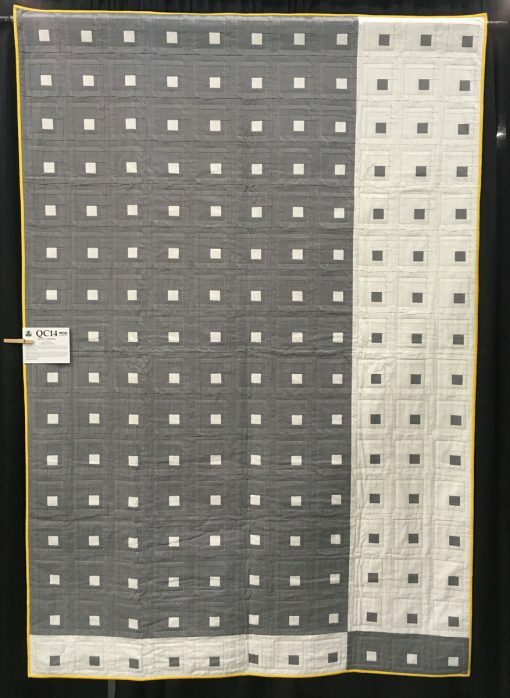 The design of the Cielo quilt is inspired by the large skies, low horizons, distant mountains, and voluminous clouds found throughout the Land of Enchantment. detail of “Cielo” by Kristi A. Schroeder. 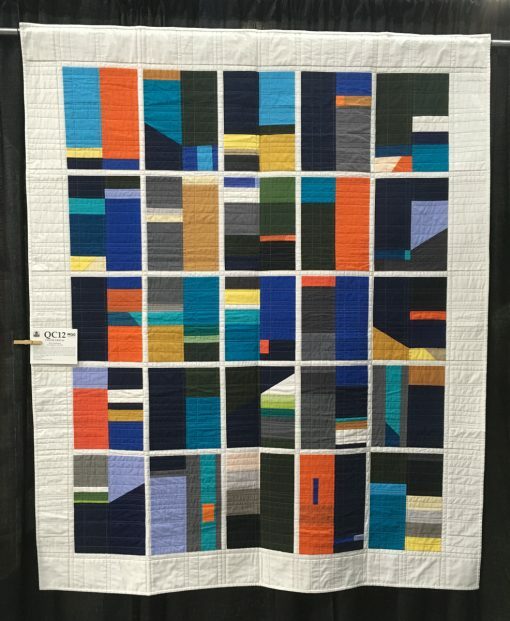 “Color Grid 01” by Kari Anderson. Statement: My first foray into improv quilting maintains a clear organization while allowing for play of colors, rectangles, and the occasional angle. I simply discover possibilities for creating depth and playing with continuity and interruption. Each block is like a stand-alone mini quilt, but together they develop relationships across the final layout. 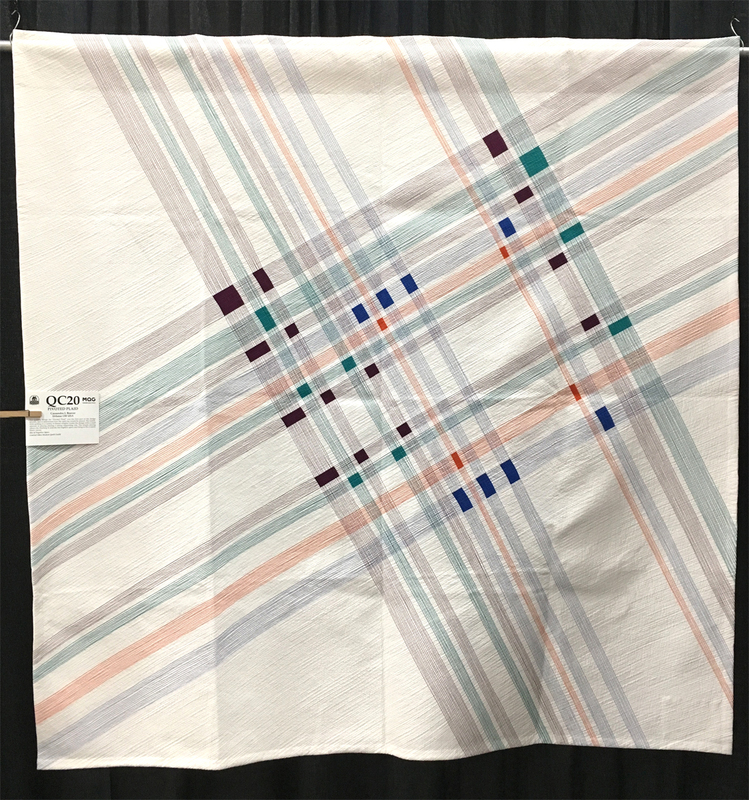 The resulting pattern, while abstract in design, suggests the grid of a city or architectural elements, among other things. 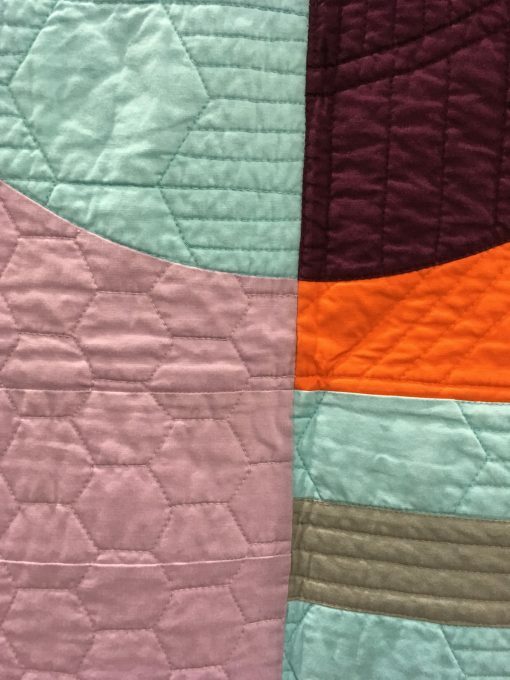 detail of “Color Grid 01” by Kari Anderson. 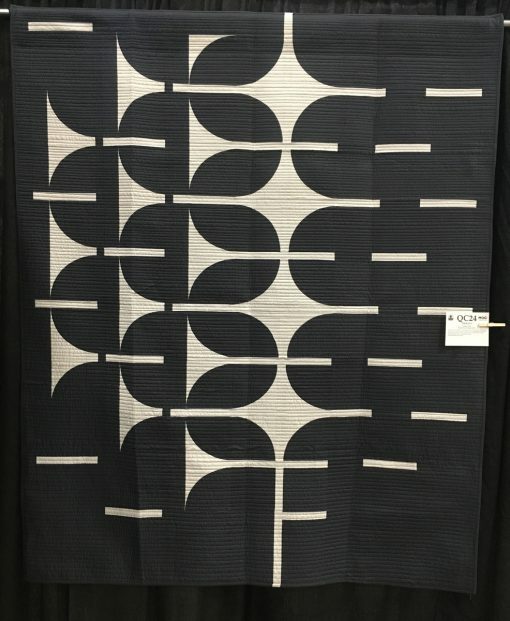 “Terrace” by Violet Craft Statement: Terrace was an experiment in minimalist design and futuristic architecture. Drawn with curved piecing and simple lines, a residential development emerged. It’s possible I’ve been watching too much Star Trek Voyager. detail of “Terrace” by Violet Craft. 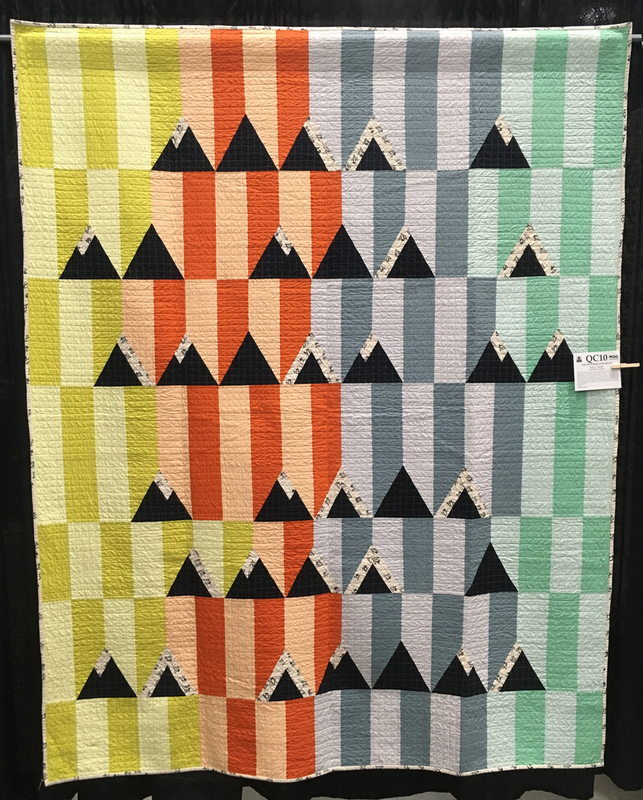 “Rocky Mountain High” by Kathryn Upitis. Statement: Rocky Mountain High was created using scraps sent to me from a friend in the USA who lives in the Colorado Rocky Mountains. I live in the Canadian Rockies. I challenged myself to make a quilt with only these scraps and one solid. Using a grey solid I created an abstract sky and mountain through minimalist design and quilting. The rainbow effect in the sky reflecting on the mountain(s) lent itself to the name Rocky Mountain High. 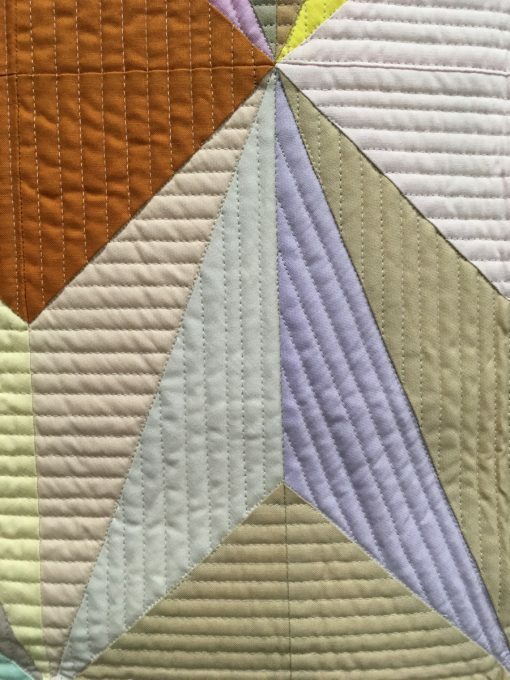 detail of “Rocky Mountain High” by Kathryn Upitis. “Tybee” by Staci Meyr. Statement: Feel the Atlantic Ocean breezes on Tybee Island, just outside of Savannah. Get cozy in the charming cottages and inns, where time slows down and the biggest decisions are where to set up the beach chairs and what to eat for dinner. 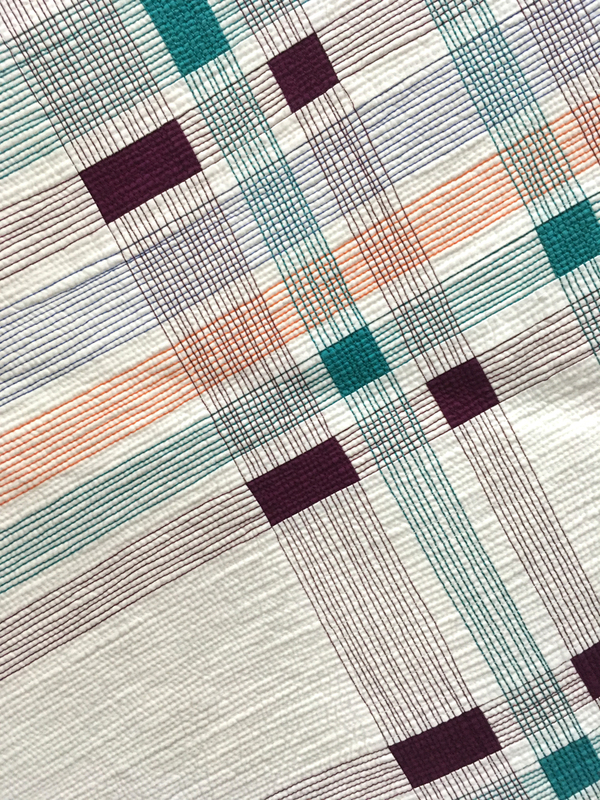 detail of “Tybee” by Staci Meyr. “The Switzerland Quilt” by Vicky F. Mueller. 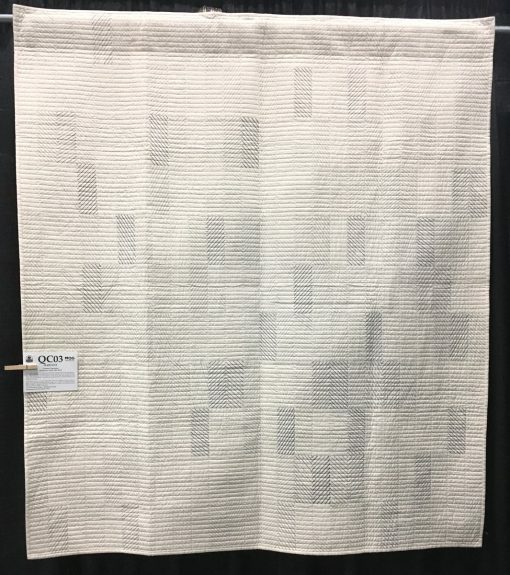 Statement: The Switzerland Quilt puts a spin on the classical composition of a main subject on a neutral backdrop. Instead of putting a focus design on a light background, the dark mountain motif is set on a lively background that shifts from cold to warm colors. 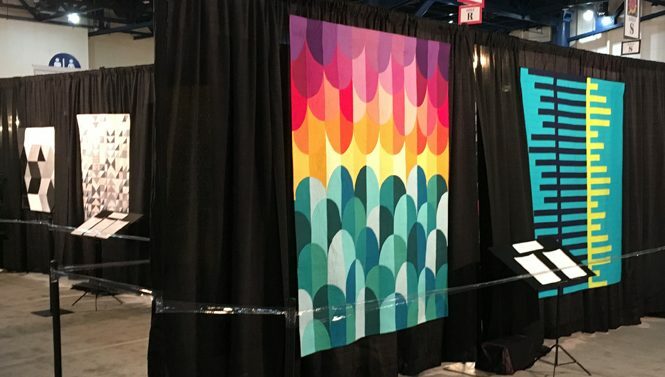 Each color group is represented by one paste and one saturated shade, as to add depth to the design. 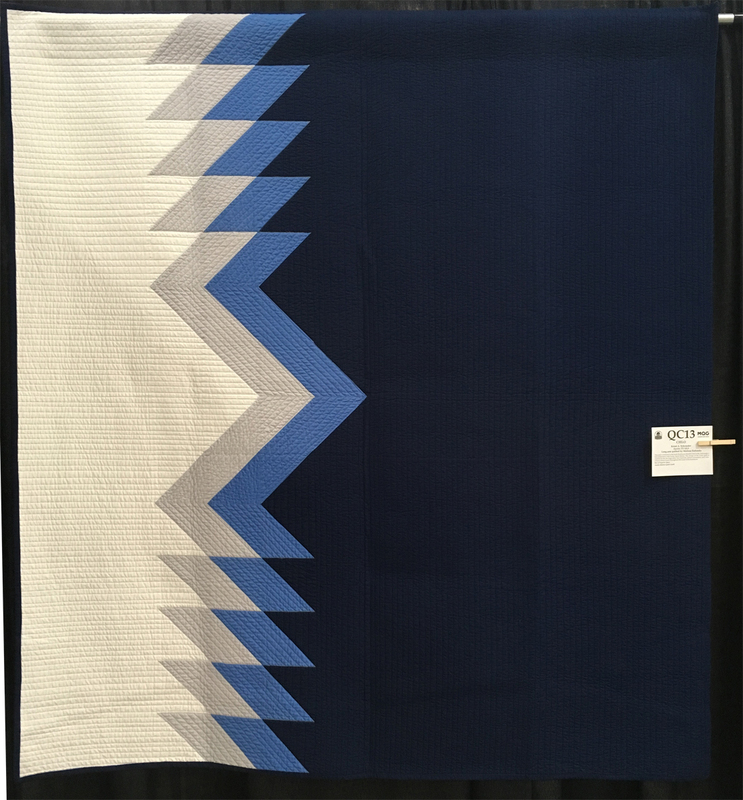 This evokes a picture of a diverse Swiss landscape as those inspiring this quilt. The Switzerland quilt is composed of equilateral triangles pieced with the foundation paper piecing method. 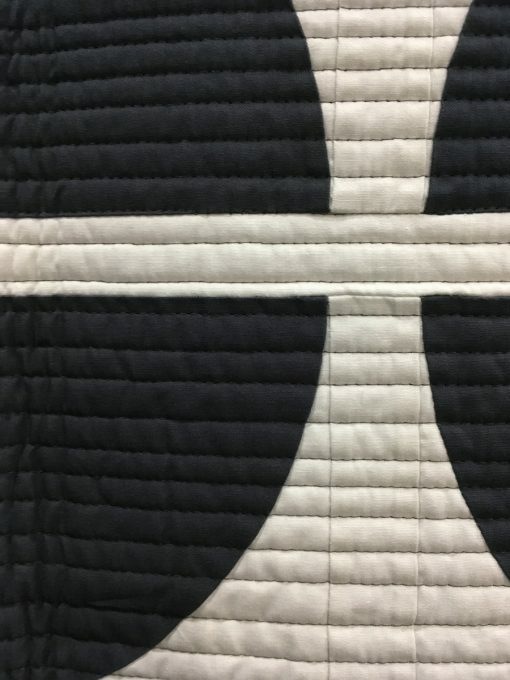 It was sewn and quilted on a small home sewing machine. 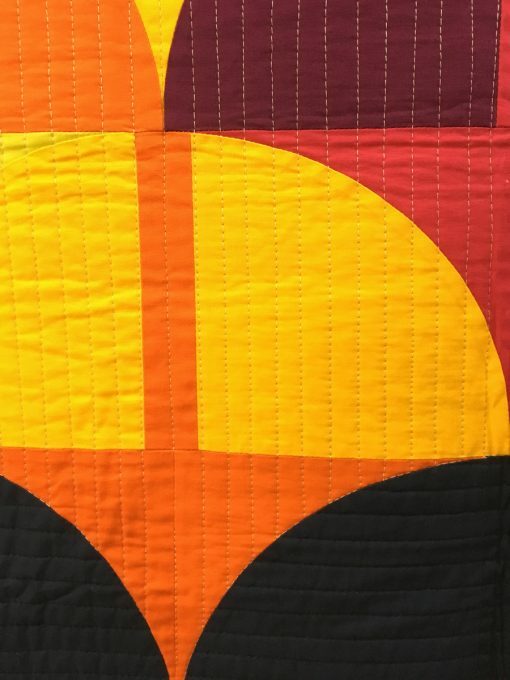 detail of “The Switzerland Quilt” by Vicky F. Mueller. “Opposites” by Katherine Jones. Statement: Exploring the ideas of small and large piecing, warm and cool colours, prints and solids I made over 700 one inch by two inch geese then joined these to form partial very large geese. 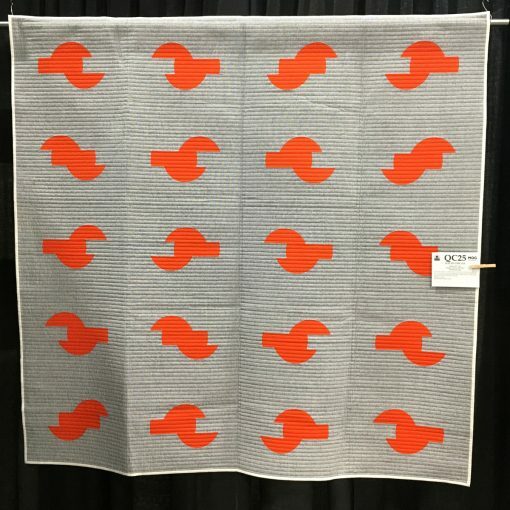 Backing is medium geese in print fabrics. 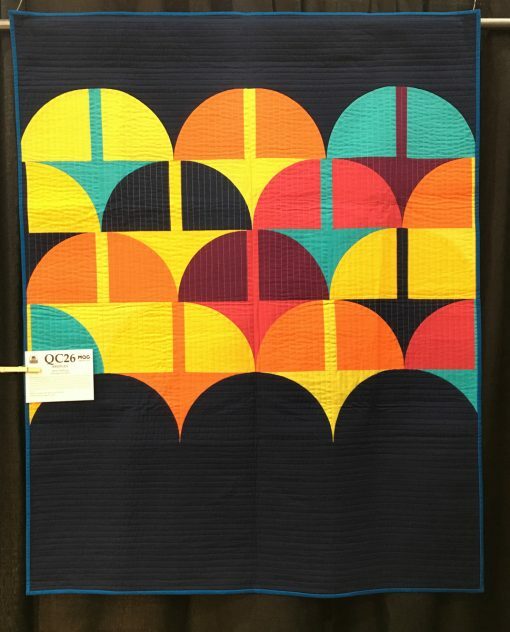 Machine quilted by longarm I created shadow geese flying in the opposite direction to the pieced geese. detail of “Opposites” by Katherine Jones. “Aura” by Nydia S. Kehnle. 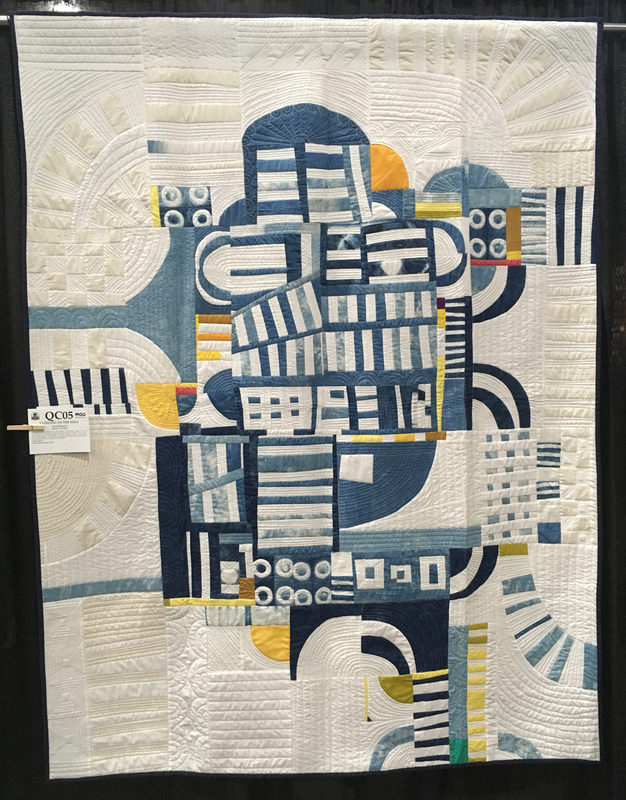 Quilted by Gina Pina. 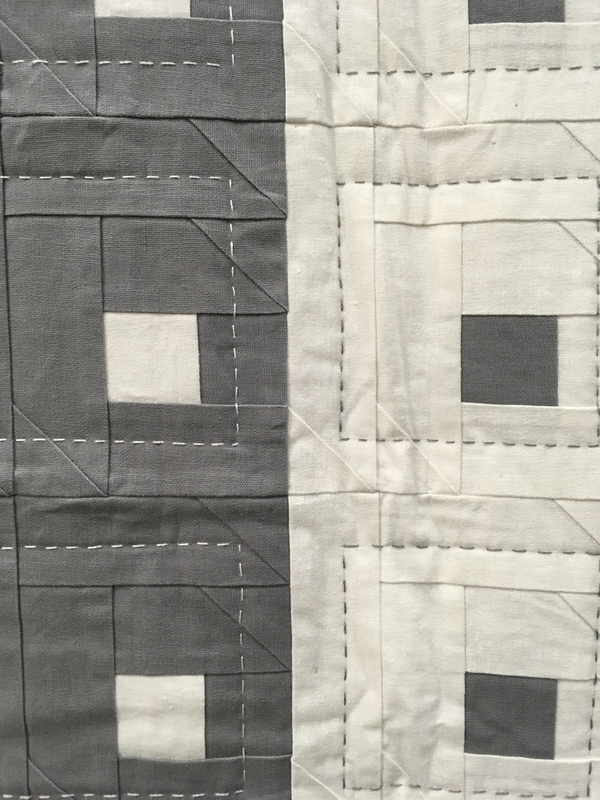 Statement: This quilt has been drafted for a few years just sitting on my computer. I was waiting to find just the right color palette for it. I really wanted a soft pastel feel with pops of dark and bright colors. Aura was foundation paper pieced. detail of “Aura” by Nydia S. Kehnle. Quilted by Gina Pina. “Broadcast” by Brigit Dermott. Statement: This quilt is a modern interpretation of a drunkard’s path that incorporates elements of a medallion quilt. 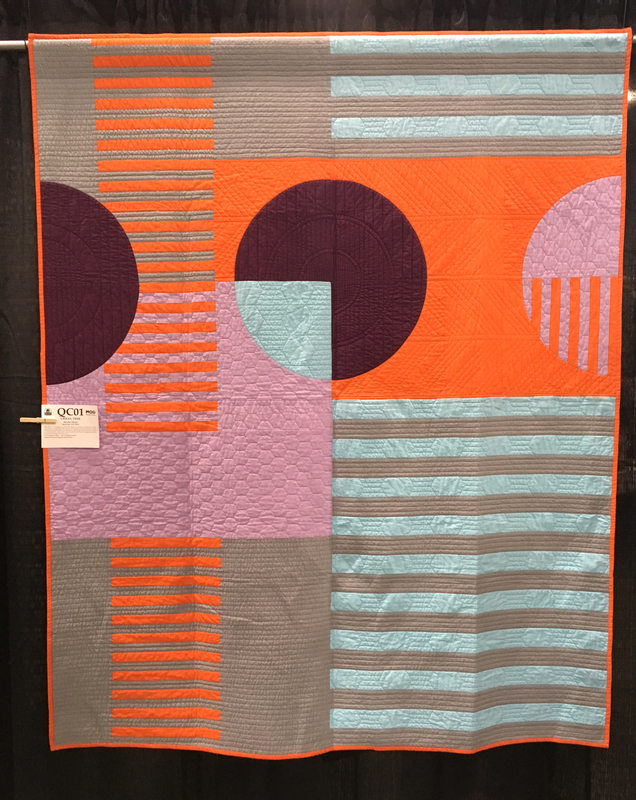 I used Latifah Saafir’s 8″ Clammy template and developed the design working from the center out. 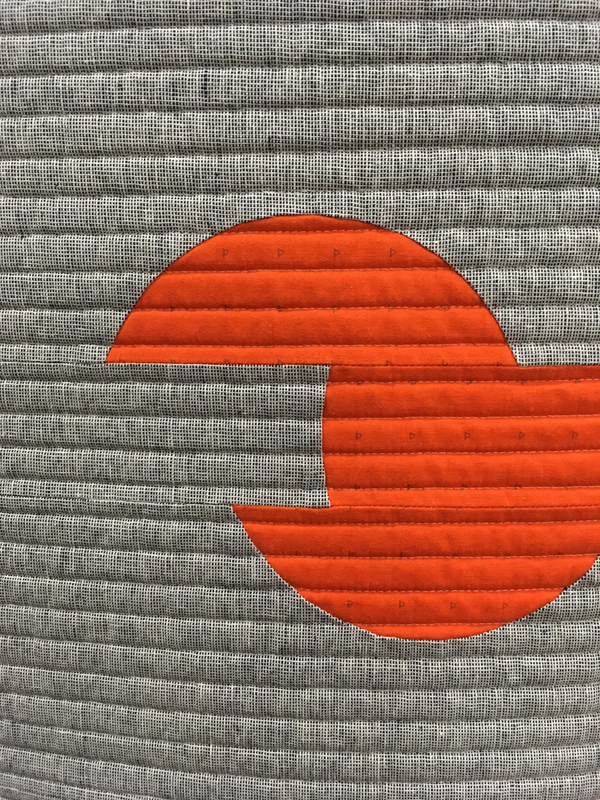 When I finished the top, I heard from other quilters that the design reminded them of the CBC logo. I looked it up and it really does. 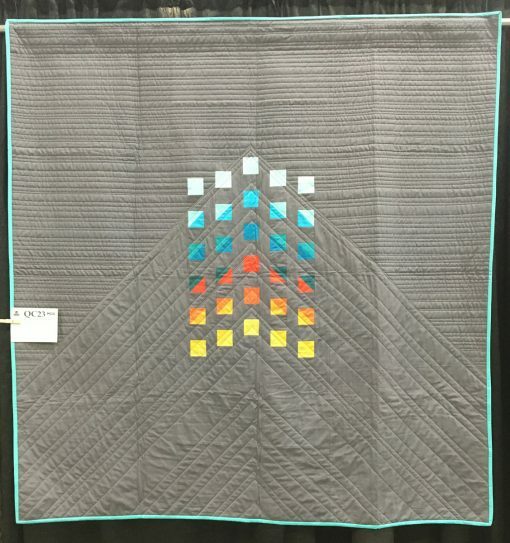 I called the quilt “Broadcast” in honor of the graphic designer, Burton Kramer, who wanted his logo to symbolize a broadcast signal. detail of “Broadcast” by Brigit Dermott. “Orange Pop” by Sophie Zaugg. 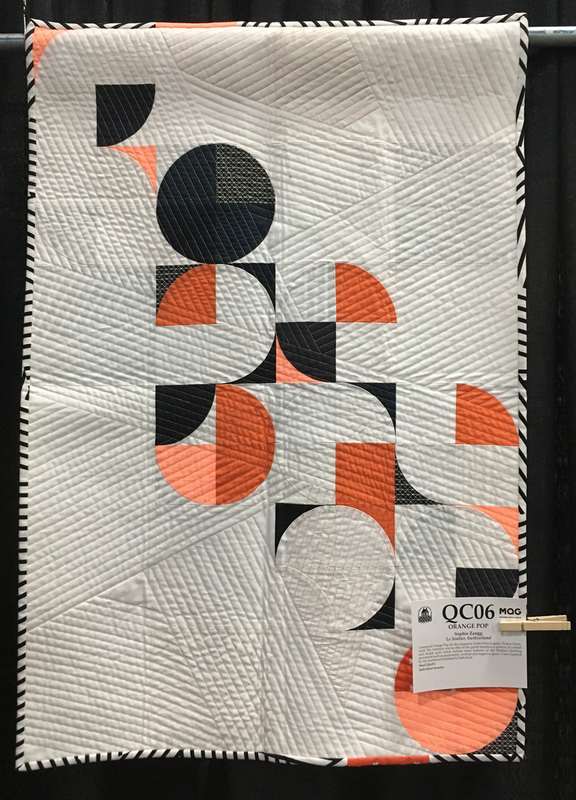 Statement: I designed Orange Pop for the magazine of the French guild, French Patchwork. My intention was to offer to the guild members a pattern of a small and simple quilt which include some features of the Modern Quilting movement such as asymmetry, contrast and negative space. I was inspired by the traditional Drunkard’s Path block. 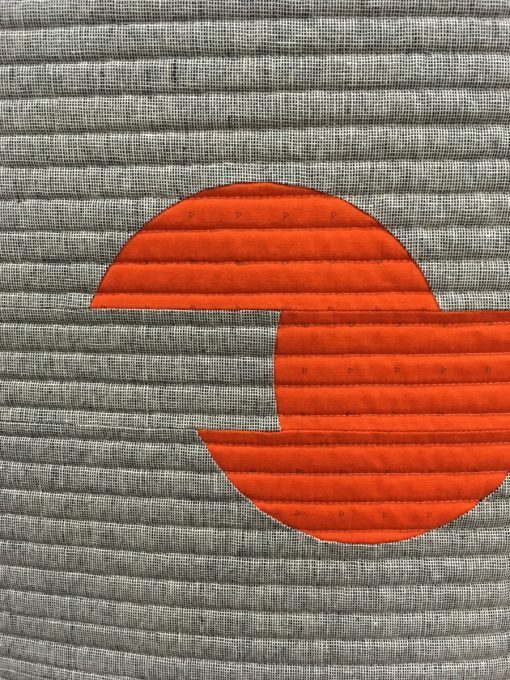 detail of “Orange Pop” by Sophie Zaugg. “Canterbury #2” by Debbie Grifka. Statement: The stunning beauty and grace of a gothic architecture never fails to inspire me. This quilt is based on a picture of a corridor near the cloisters in Canterbury Cathedral (Canterbury, England). Eliminating everything except the bare bones of the architecture keeps the focus on the hallway itself as it draws you to follow deeper into the cathedral. Restricting the color palette to black and white avoids the distraction of color and keeps the attention on the architectural lines. 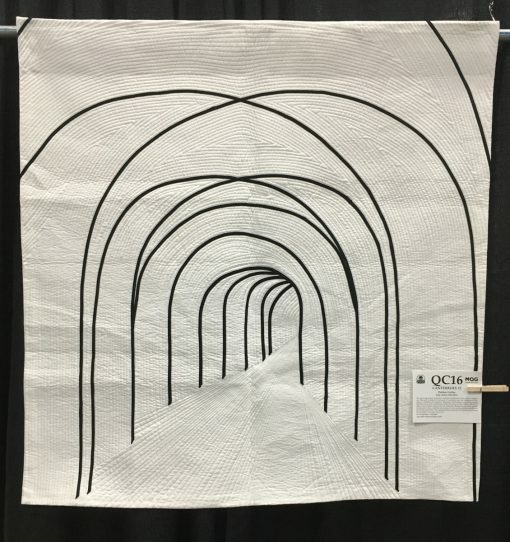 The quilting further separates the path forward from the beautiful, airy space around it. 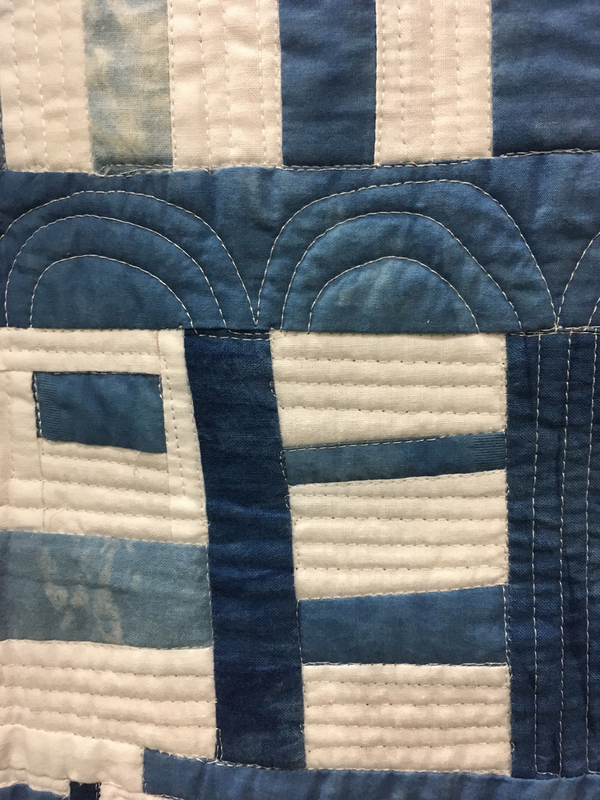 detail of “Canterbury #2” by Debbie Grifka. “Clinging to the Edge” by Irene Roderick. 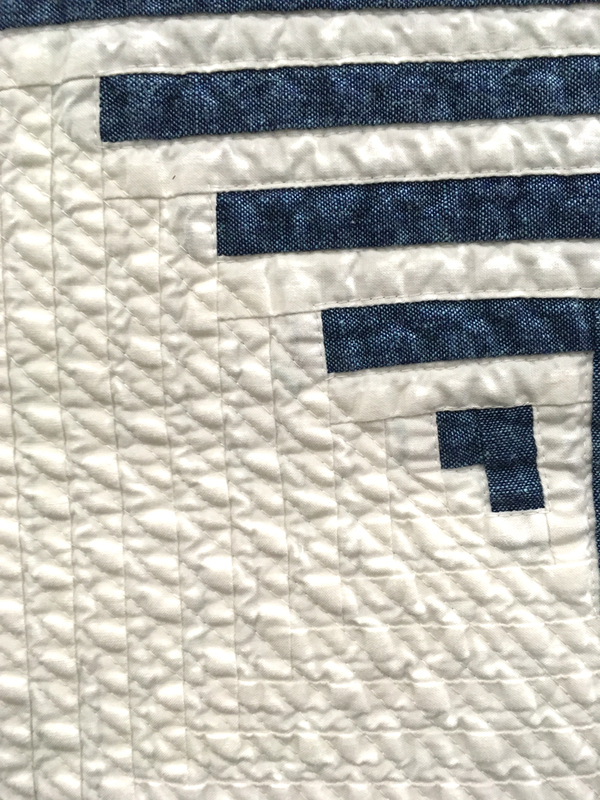 Statement: This quilt is one of a series I am calling “Roopetoope” quilts. They are whimsical and cheerful, planned by improv-pieced. When I was a child, my nickname was “Roopetoope” and these quilts are meant to remind me how to play again. As the quilt took shape, it seemed to be a self-portrait and expression of my current frame of mind. detail of “Clinging to the Edge” by Irene Roderick. 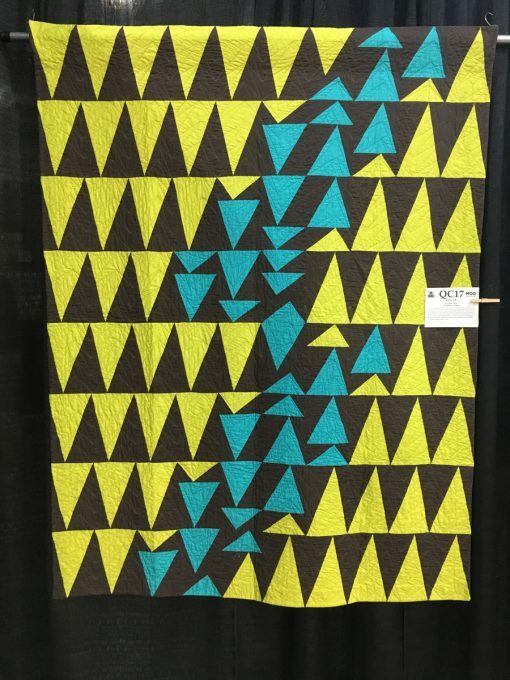 “Mod Drunk” by Wanda A. Dotson. Statement: Mod Drunk explores the design element, EMPHASIS, as part of Savor Each Stitch Book Bee. 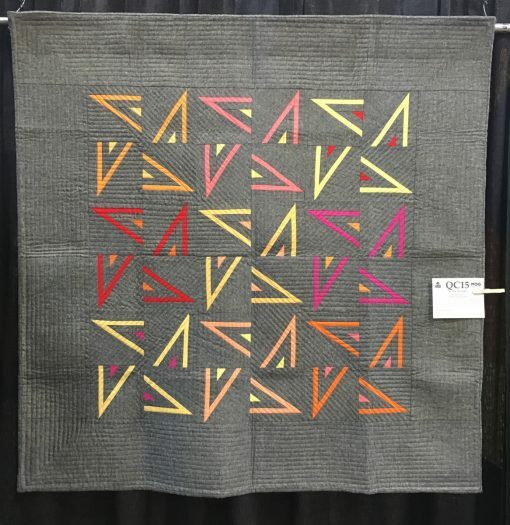 The project from Carolyn Friedlander’s book involved a block with 10 pieces. 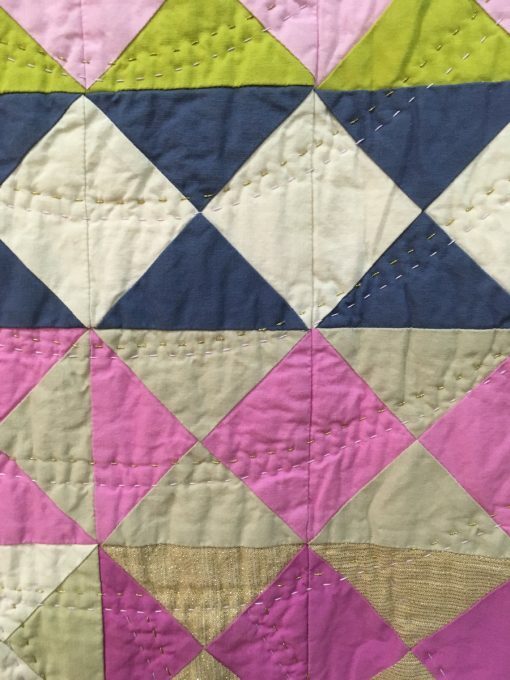 By changing the color of each piece she changed which part stood out. 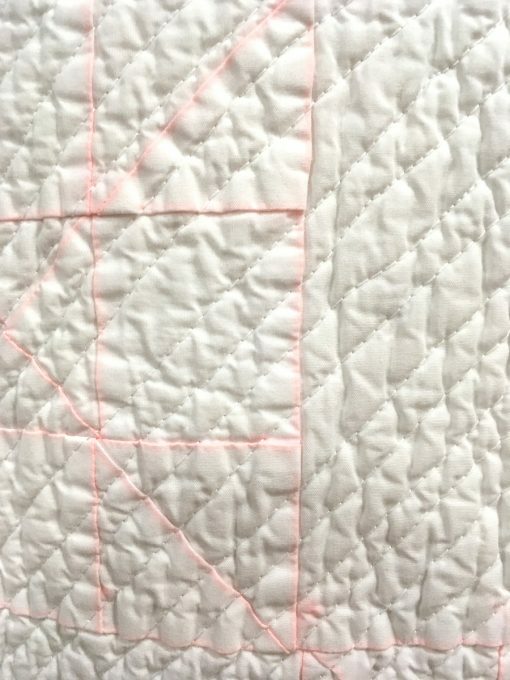 I had observed a quilting friend’s traditional block sampler and mused about how the Drunkard’s Path stood out, and I liked it a lot. 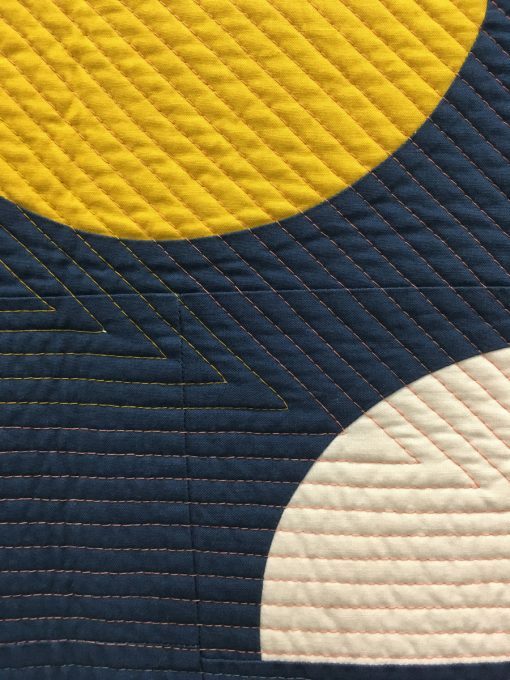 I started making quarter circles and experimented with changing the emphasis in this traditional block to make something unique. 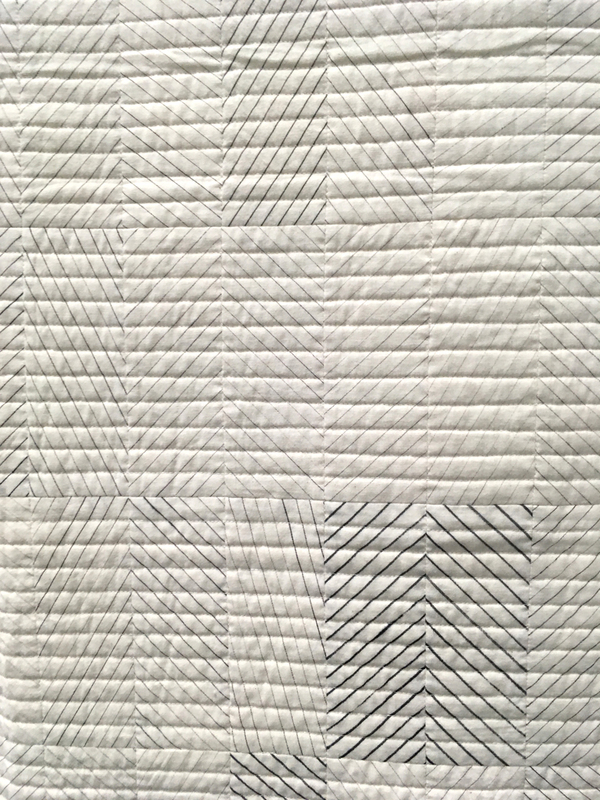 The hand quilting also explores emphasis by using the same color thread in the background gray. 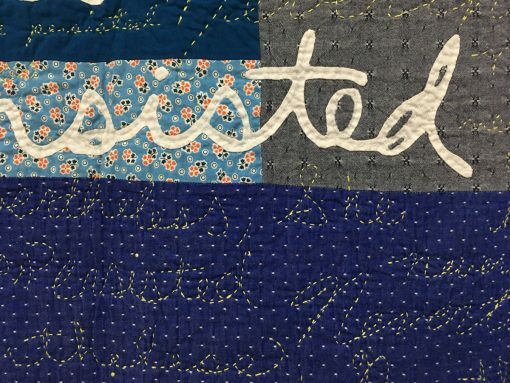 detail of “Mod Drunk” by Wanda A. Dotson. “Harvest” by Carson Converse. Statement: I am often inspired by patterns and rhytms found in nature and agriculture. 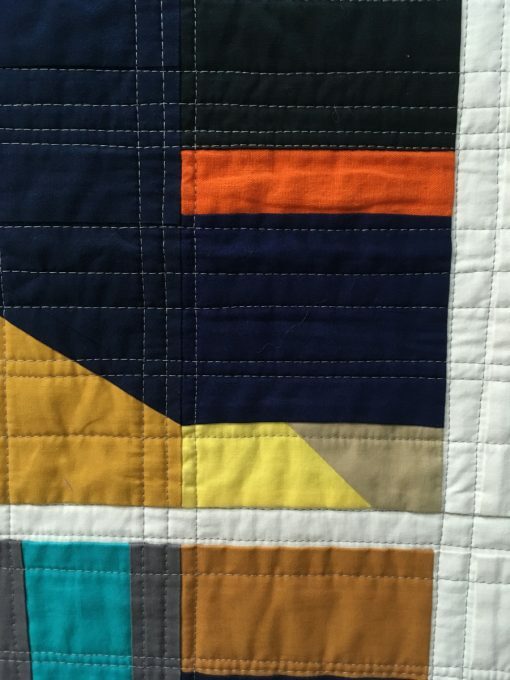 The inspiration for this quilt was corn stubble left in a field after harvest. The repetition of short stocks—each cut to the same height but left askew by the machinery—created a textural field that was both minimal and visually complex. 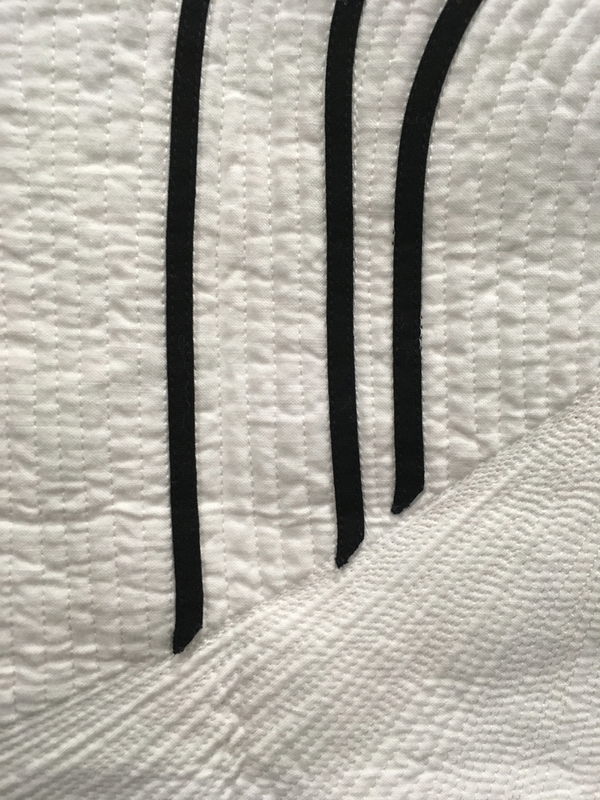 Each block was cut to size before the lines were added. I used a ruler to guide a permanent marker, but the angle was random ensuring that each bock would be slightly different. The speed in which I moved the marker influenced the weight of the lines. detail of “Harvest” by Carson Converse. “Going Up” by Stephanie Skardal. Statement: Inspired to create unexpected shapes with negative space in traditional (but large) log cabin blocks, “Going Up” mixes the hard of high contrast and graphic lines with the organic look of essex linen and straight-line quilting. 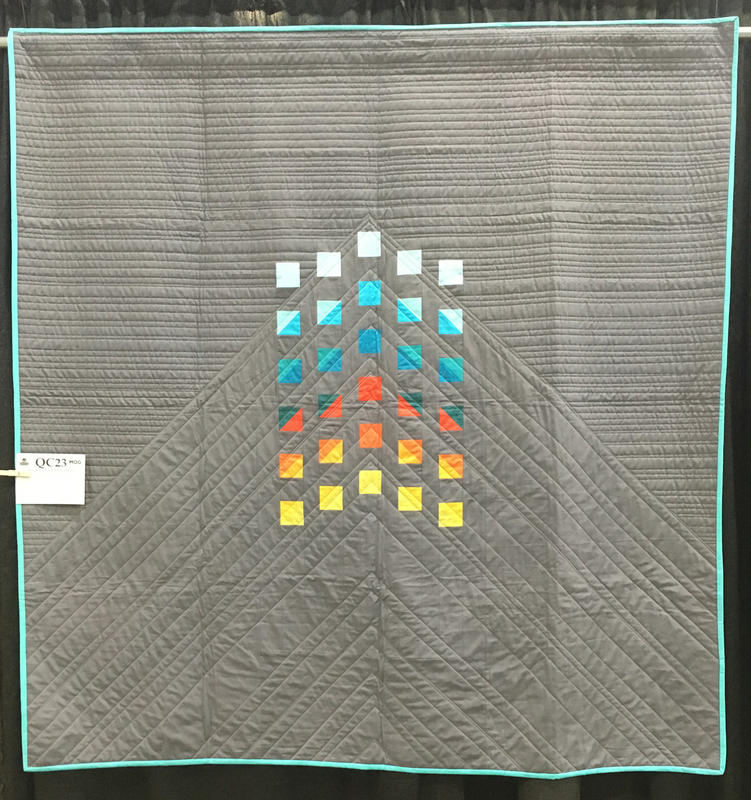 This original design was created in Photoshop and machine quilted on a domestic machine. detail of “Going Up” by Stephanie Skardal. Thanks for taking the time to share these quilts again from the exhibit. Thanks for this great post! 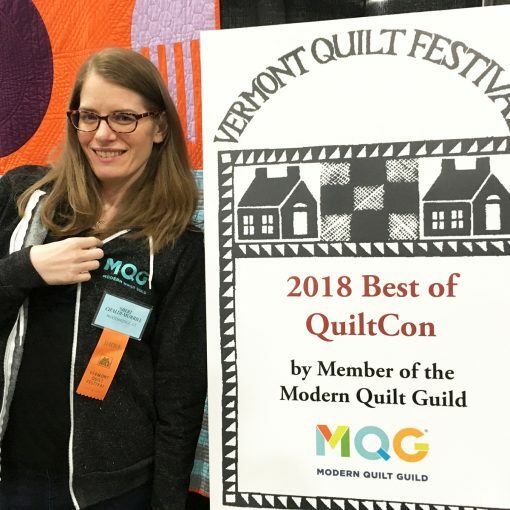 I was happy to see my quilt Broadcast in VT—wish I was there! Hi Brigit, so happy I was able to share. I loved being able to see your quilt up close! Lovely post! 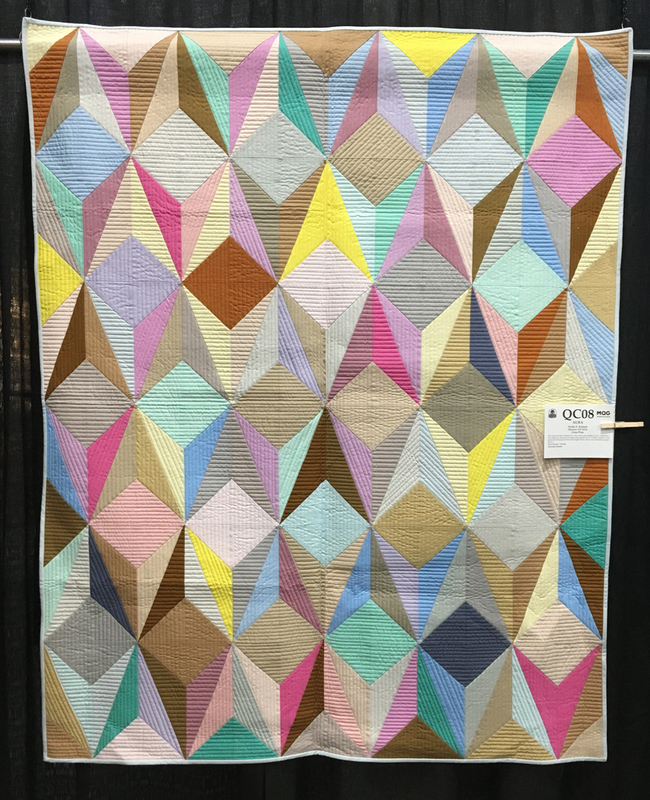 As a new quilter I am drawn to modern quilts and these are amazing. The technical mastery is mind boggling and inspiring. Thank you for sharing!